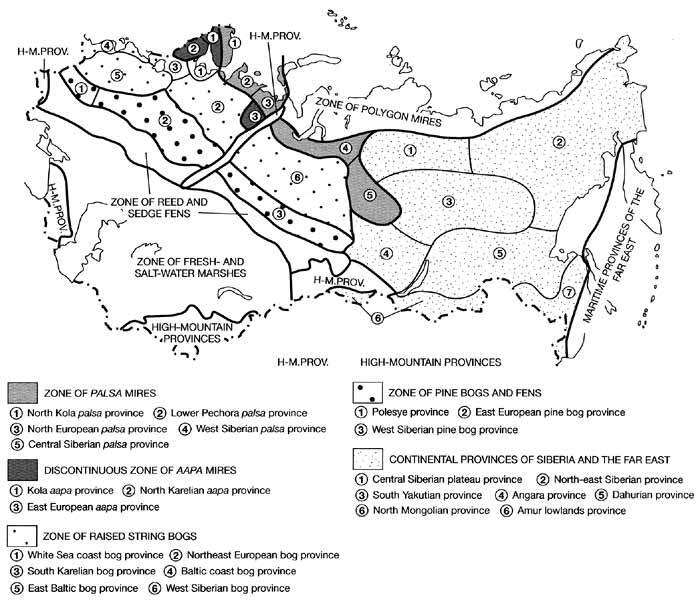 Many different types of mire occur in Northern Eurasia and several latitudinal mire zones are distinguished which reflect general features of the corresponding biomes (Figure 9.8). There are various classifications of mires with respect to their stage of development, dominating plant communities, hydrochemical conditions, and water sources (Katz, 1971; Botch and Masing, 1983). The main typology, applied to the boreal zone, divides mires according to the trophic conditions into three categories: (1) eutrophic (low), (2) mesotrophic (transitional); and (3) oligotrophic (raised). Similarly, three classes of peat are recognized: (1) eutrophic (with ash content of 6-7 per cent and pH 5-7); (2) mesotrophic (ash content 4-6 per cent and pH 4-5) and oligotrophic (ash content 2-5 per cent and pH 2.5-3.6). Eutrophic and oligotrophic peats account for 48 per cent and 33 per cent of all peat deposits of the FSU, respectively (Katz, 1971; Botch and Masing, 1983). Exceptionally large areas are occupied by mires in the forest-tundra and taiga zones, especially in West Siberia where impeded drainage, ample moisture supply and warm summers create ideal conditions for their development (Figure 9.9). 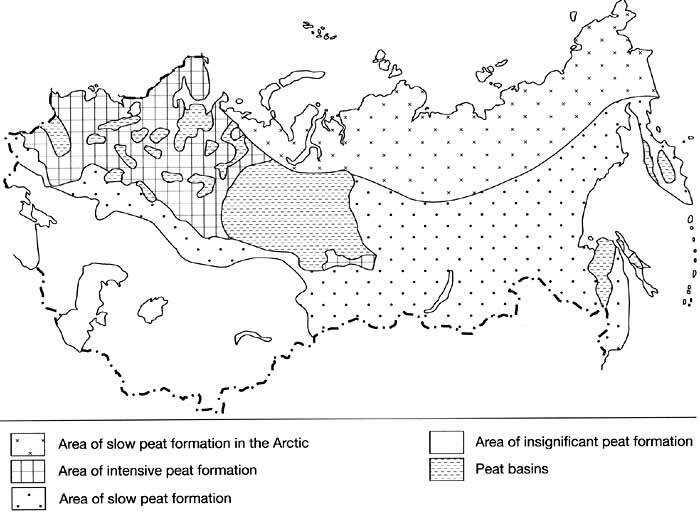 Over 11 per cent of the West Siberian plain is covered by peatlands compared to under 6 per cent in the European part (Katz and Neishtadt, 1963). Two types of mires, generally corresponding to the forest-tundra and taiga zones, dominate in the European territory and Western Siberia: palsa mires, composed of frozen mounds or ridges (palsas) alternating with wet hollows, are typical of the forest-tundra while oligotrophic raised bogs are most widely distributed in the taiga biome (Figure 9.8). Aapa mires (treeless areas with a concave surface and alternating mesotrophic or oligotrophic ridges and mesotrophic or eutrophic hollows) are another widespread type in northern Karelia and in the northern taiga of the East European and West Siberian plains. Further east, dissected terrain and meagre precipitation restrict the development of mires mainly to the Arctic coast. Wooded mires, covered by Larix sibirica, Betula spp., and Pinus sylvestris, with a poorly developed peat layer occur on the Central Siberian plateau and in the Angara province, while sedge-moss fens are typical of the South Yakutian province. The character of palsa mires changes with latitude, although there is no fundamental difference between the northern and the southern palsas. In the north, flat palsas dominate with the height of the mounds not exceeding 2 m. Further south, in the forest-tundra, mounds become dome-shaped, developing to a height of 3-6 (locally 10-11) m and at the southern limit of the zone, permafrost disappears under the hollows. This mire subzone is termed 'high palsas'. In European territory, palsas develop in the forest-tundra of the Kola peninsula and the White Sea coast extending into the northern taiga in the north-east. Only in the north-eastern province do palsas contain an ice core. In Siberia, high palsas occur mainly in the forest-tundra and northern taiga in the west where they cover about 50 per cent of the territory, extending further south along the Yenisey in Central Siberia (Figure 9.8). The vegetation is composed of dwarf shrubs (Ledum palustre, Vaccinium uliginosum, V. vitis-idaea), mosses (Dicranum, Polystichum, and Sphagnum) and lichens which develop on the top of the mounds. On the tops of the tall mounds, the substrate is dry and vegetation is sparse. In winter, snow does not cover the tall mounds completely and wind erosion often develops. The hollows are occupied by sedges, Eriophorum spp. and Sphagnum mosses. The peat consists of herb, sedge and Sphagnum mosses remains and its depth varies between 1 m and 3 m reaching 5 m in the south of the Siberian palsa provinces (Botch and Masing, 1983). Raised bogs with convex cupola, composed of oligo-trophic Sphagnum peat, dominate in taiga. Raised bogs occupy extensive areas, particularly on the watersheds in Western Siberia. The territory of the world's largest bog, Vasyuganskoe, for example, exceeds 5 million ha and it contains 14.3 x 109 tonnes of peat (Katz and Neishtadt, 1963). Large bogs have a specific topography: extensive gently inclined slopes and a plateau in the centre which domes up to 10 m above the inundated bog margins. On the better-drained convex surfaces of Siberian bogs, stands of Pinus sylvestris and P. sibirica occur with dwarf shrubs and Sphagnum mosses. In European territory, vegetation of heath type dominates, with the exception of the East Baltic province, where pine stands are also common (Figure 9.8). The depth of peat is smaller and ranges mainly between 3 m and 8 m. In the flat sites close to the centre of a bog, where drainage is extremely limited, secondary lakes develop separated from each other by low peat ridges covered mainly by Sphagnum fuscum. It is these lake complexes that stabilize the system of a raised bog as a natural entity. The environment of the West Siberian plain provides the ideal conditions for paludiflcation and mires, which have been developing in Western Siberia throughout the Holocene, had already reached the bog stage in the Boreal, while in the European territory this transition occurred during the Atlantic (Katz and Neishtadt, 1963). The greatest rates of peat accumulation occurred in the Subatlantic, reaching 0.8-3.0 mm a-1, and at present phytomass reserves in the West Siberian mires can exceed 17 kg m-2 and net primary productivity varies between 400 and 780 g m-2 a-1 (Botch and Masing, 1983). Peat plays an important role in controlling erosion through the accumulation of water. Due to their enormous extent, peatlands in the Vasyugansk region prevent the development of erosion on the watersheds which otherwise would intensify because of the tectonic uplift of the region (Katz and Neishtadt, 1963).